Long ago, when they buried the chief—tuukg^uu [chief, leader] I always call it—of the village and the islands, they buried him with his things that he treasured and were sacred and put them in the cave. 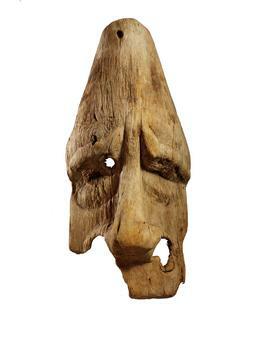 This mask, probably made for a hunting ceremony several centuries ago, was found in a burial cave on Tigalda Island. Mary Bourdukofsky: Well, the story I used to hear was that long ago, when they buried the chief—tuukg^uu [chief, leader] I always call it—of the village and the islands, they buried him with his things that he treasured and were sacred and put them in the cave where they put him after they mummified him. I think the rest of his things were handed down to the sons and their grandchildren and so on. And another story I heard from my dad is that Aleuts taught themselves how to cure. And if somebody died, they say they wrapped them up like a mummy, but they took all the insides out and studied their insides to figure out the cause of the death. And before they buried them, they stuffed them with grass and moss, then wrapped them all up. That’s where the mummies come from, and women started making burial masks for them. 1. There was very little discussion of this mask by Elders. These comments come from discussion of mask NMNH E007604. This is one of a dozen old, weathered masks that were taken from a cave on Tigalda Island in the early years of the 20th century. The exact circumstances of the find are unknown. Masks have been found at other several caves in the Aleutian Island chain.